One of the most promising and exciting developments in the world of refractive surgery has been the advent of laser in situ keratomileusis (LASIK). The surgical technique involves the creation of a hinged lamellar corneal flap, after which an excimer laser is used to make a refractive cut on the underlying stromal bed. LASIK is a fusion of old and new technologies, with its roots in keratomileusis and automated lamellar keratectomy (ALK). However, as currently practiced, it is perhaps best thought of as photorefractive keratectomy (PRK) performed under a flap instead of on the corneal surface. LASIK has been available in the United States as an off-label procedure since the mid 1990s. FDA approval of excimer lasers for LASIK dates to about 1999. Many millions of procedures have been performed worldwide. According to the American Society of Cataract and Refractive Surgery, about 700,000 procedures a year are currently performed in the United States. 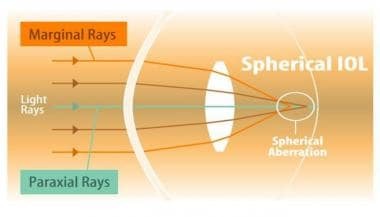 Spherical aberration: a schematic diagram for the human eye. Jose Barraquer is generally credited with much of the early work leading to corneal lamellar refractive procedures as they are currently practiced. He noted that refractive change could be accomplished in the cornea by tissue addition or subtraction. He subsequently developed the idea of resecting a corneal disc and freezing it, followed by shaping the disc with a cryolathe. [2, 3, 4] However, the technique was limited by complexity of the equipment and tissue damage to the resected corneal disc caused by freezing. Ruiz and Barraquer performed keratomileusis in situ in the late 1980s. Using principles developed by Krumeich, this technique involved first removing a corneal disc with a microkeratome. Refractive change was accomplished by performing a second plano cut with the microkeratome. The thickness and diameter of this second disc of tissue determined the end refractive result; then, the first disc was sutured back onto the cornea. Problems included complexity, poor predictability, and irregular astigmatism. Burratto and Pallikaris were the first to combine the use of the excimer laser and microkeratome technology. Burratto's original work involved performing a corrective excimer laser ablation on the back of a resected disc of corneal tissue. This disc was replaced and sutured onto the cornea. Pallikaris developed the technique of performing the excimer laser corrective ablation in the corneal stromal bed under a hinged flap. He first studied the procedure in rabbits, followed by blind human eyes in 1989, and then sighted eyes in 1991. In 1993, Steve Slade added the refinement of using an automated microkeratome to create the flap and was one of the first US surgeons to perform LASIK. As of 2018, LASIK has been approved by the Food and Drug Administration (FDA) for several different laser platforms, including the VISX STAR S4, Allegretto Wavelight, Technolas, and NIDEK lasers. The approved range for myopic, hyperopic, and custom treatments varies slightly between platforms. Table 1 summarizes these devices and their FDA status. The cornea is a thin layer of transparent tissue that protects the intraocular contents and refracts light. Average central corneal thickness is about 550 µm, increasing to about 700 µm in the periphery. The cornea has a diameter (from the front surface) of about 11 mm vertically and 12 mm horizontally. The air-tear interface is the first refractive surface that light encounters and accounts for about 80% of the eye's total refractive power; the average corneal curvature (K readings) in the adult cornea is approximately 44.00 diopters (D). Anatomically, the cornea consists of 5 layers: epithelium, Bowman layer, stroma, Descemet membrane, and endothelium. Three types of cells are present in the epithelium: (1) basal columnar cells attached to the epithelial basement membrane via hemidesmosomes, (2) wing cells noted for thin winglike projections, and (3) surface cells joined by connecting bridges and covered by microvilli. Mucin is attached strongly to the surface. Usually, 5-7 layers of cells are present. Unlike stratified squamous epithelium in other areas of the body, the epithelium in the eye has an exceptionally smooth and regular surface, contributing to the transparency and light transmission characteristics of the cornea. The Bowman layer is not a membrane, but rather an acellular structure consisting of collagen and representing the most superficial layer of the stroma. The stroma makes up about 90% of the corneal thickness and consists of regularly arrayed flattened bundles of collagen called lamellae. Approximately 200-250 lamellae are present in the human cornea. Each bundle extends the width of the cornea and is about 2 µm thick and up to 260 µm wide. The parallel arrangement of these bundles together with the uniform spacing between collagen fibrils helps explain corneal transparency. Although relatively acellular, stromal fibroblasts called keratocytes can be found scattered throughout the stroma between lamellae, and they are responsible for collagen production and wound healing. The Descemet membrane is composed of a fine latticework of collagen fibers. It represents a true basement membrane, and it is produced by the corneal endothelium. The endothelium is a single layer of hexagonal cells whose sole purpose is to act as a barrier to the influx of fluid into the cornea and to pump fluid out of the cornea keeping it deturgesced and clear. These cells are incapable of regeneration. Contraindications include unstable refractive error, active collagen vascular disease (especially in the presence of iritis or scleritis), pregnancy, presence of a pacemaker, any ongoing active inflammation of the external eye (eg, conjunctivitis, severe dry eye), and a refractive error outside the range of laser correction. Other contraindications include leaving less than a calculated residual bed of 250 µm of untouched cornea, as well as signs, symptoms, or topographic findings consistent with keratoconus. Residual stromal bed thickness is calculated by subtracting ablation depth plus flap thickness from the corneal thickness as measured by pachymetry. Patients who are on Accutane (isotretinoin), Cordarone (amiodarone hydrochloride), and Imitrex (sumatriptan) should be treated with caution, and patient counseling should be provided because these medications may adversely affect corneal wound healing. A history of herpetic keratitis is a relative contraindication. Although patients have been treated safely with a history of herpes simplex keratitis and the appropriate use of prophylactic antivirals, reactivation of the virus following treatment remains a concern. Patients who cannot cooperate with procedures under a topical anesthetic and cannot accurately fixate or lay flat without difficulty are poor candidates for refractive surgery. U.S. Food and Drug Administration. FDA-Approved Lasers for PRK and Other Refractive Surgeries. U.S. Food and Drug Administration. Available at http://65. http://www.fda.gov/MedicalDevices/ProductsandMedicalProcedures/SurgeryandLifeSupport/LASIK/ucm192110.htm. Accessed: December 8, 2014. Barraquer JI. Queraplastia Refractiva. Estudios Inform. 1949. 10:2-21. Barraquer JI. Results of myopic keratomileusis. Journal of Refractive Surgery. 1987. 3:98-101. Barraquer JI. The history and evolution of keratomileusis. Int Ophthalmol Clin. 1996 Fall. 36(4):1-7. [Medline]. Smolin G, Thoft RA. Basic Science: Anatomy of the Conjunctiva, Cornea and Limbus. The Cornea. 1994. 3-12. Kanski JJ. Disorders of the Cornea and Sclera. Clinical Ophthalmology: A Systematic Approach. 3rd ed. Revised. ISBN 0 7506 1886 8: 1994. 100. Durairaj VD, Balentine J, Kouyoumdjian G, et al. The predictability of corneal flap thickness and tissue laser ablation in laser in situ keratomileusis. Ophthalmology. 2000 Dec. 107(12):2140-3. [Medline]. Petrauskas J. Reinventing Refraction with Wave front Technology. EyeNet. 2000. 4:33-35. Chalita MR, Finkenthal J, Xu M, Krueger RR. LADARWave wavefront measurement in normal eyes. J Refract Surg. 2004 Mar-Apr. 20(2):132-8. [Medline]. Koffler MC, Burlew JA. Corneal Topography and the Corneal Modeling System. Mediguide Ophthalmology. 1991. 6:1-5. Wilson EW, Klyce SD. Screening for Corneal Topography Abnormalities before Refractive Surgery. Ophthalmology. 1994. 101:147-52. Rabinowitz YS. Videokeratographic indices to aid in screening for keratoconus. J Refract Surg. 1995 Sep-Oct. 11(5):371-9. [Medline]. Arevalo JF, Ramirez E, Suarez E, et al. Incidence of vitreoretinal pathologic conditions within 24 months after laser in situ keratomileusis. Ophthalmology. 2000 Feb. 107(2):258-62. [Medline]. Huppertz M, Schmidt E, Winfried T. Eye tracking and refractive surgery. Customized Corneal Ablation: The Quest for SuperVision. 1st ed. 2001. 149-160. Perez-Santonja JJ, Ayala MJ, Sakla HF, Ruiz-Moreno JM, Alio JL. Retreatment after laser in situ keratomileusis. Ophthalmology. 1999 Jan. 106(1):21-8. [Medline]. Jacobs JM, Sanderson MC, Spivack LD, Wright JR, Roberts AD, Taravella MJ. Hyperopic laser in situ keratomileusis to treat overcorrected myopic LASIK. J Cataract Refract Surg. 2001 Mar. 27(3):389-95. [Medline]. Hsu SY, Chang MS, Lee CJ. Intraocular pressure assessment in both eyes of the same patient after laser in situ keratomileusis. J Cataract Refract Surg. 2009 Jan. 35(1):76-82. [Medline]. Gimbel HV, Penno EE, van Westenbrugge JA, Ferensowicz M, Furlong MT. Incidence and management of intraoperative and early postoperative complications in 1000 consecutive laser in situ keratomileusis cases. Ophthalmology. 1998 Oct. 105(10):1839-47; discussion 1847-8. [Medline]. Stulting RD, Carr JD, Thompson KP, Waring GO 3rd, Wiley WM, Walker JG. Complications of laser in situ keratomileusis for the correction of myopia. Ophthalmology. 1999 Jan. 106(1):13-20. [Medline]. Wilson SE. LASIK: management of common complications. Laser in situ keratomileusis. Cornea. 1998 Sep. 17(5):459-67. [Medline]. Joo CK, Kim TG. Corneal perforation during laser in situ keratomileusis. J Cataract Refract Surg. 1999 Aug. 25(8):1165-7. [Medline]. Jacobs JM, Taravella MJ. Incidence of intraoperative flap complications in laser in situ keratomileusis. J Cataract Refract Surg. 2002 Jan. 28(1):23-8. [Medline]. John T, Velotta E. Nontuberculous (atypical) mycobacterial keratitis after LASIK: current status and clinical implications. Cornea. 2005 Apr. 24(3):245-55. [Medline]. Chang MA, Jain S, Azar DT. Infections following laser in situ keratomileusis: an integration of the published literature. Surv Ophthalmol. 2004 May-Jun. 49(3):269-80. [Medline]. Webber SK, Lawless MA, Sutton GL, Rogers CM. Staphylococcal infection under a LASIK flap. Cornea. 1999 May. 18(3):361-5. [Medline]. Smith RJ, Maloney RK. Diffuse lamellar keratitis. A new syndrome in lamellar refractive surgery. Ophthalmology. 1998 Sep. 105(9):1721-6. [Medline]. Moshirfar M, Welling JD, Feiz V, Holz H, Clinch TE. Infectious and noninfectious keratitis after laser in situ keratomileusis Occurrence, management, and visual outcomes. J Cataract Refract Surg. 2007 Mar. 33(3):474-83. [Medline]. Wang MY, Maloney RK. Epithelial ingrowth after laser in situ keratomileusis. Am J Ophthalmol. 2000 Jun. 129(6):746-51. [Medline]. Muller LT, Candal EM, Epstein RJ, Dennis RF, Majmudar PA. Transepithelial phototherapeutic keratectomy/photorefractive keratectomy with adjunctive mitomycin-C for complicated LASIK flaps. J Cataract Refract Surg. 2005 Feb. 31(2):291-6. [Medline]. Solomon R, Donnenfeld ED, Perry HD. Photorefractive keratectomy with mitomycin C for the management of a LASIK flap complication following a penetrating keratoplasty. Cornea. 2004 May. 23(4):403-5. [Medline]. Pande M, Hillman JS. Optical zone centration in keratorefractive surgery. Entrance pupil center, visual axis, coaxially sighted corneal reflex, or geometric corneal center?. Ophthalmology. 1993 Aug. 100(8):1230-7. [Medline]. Lam DS, Leung AT, Wu JT, et al. Management of severe flap wrinkling or dislodgment after laser in situ keratomileusis. J Cataract Refract Surg. 1999 Nov. 25(11):1441-7. [Medline]. Donnenfeld ED, Perry HD, Doshi SJ, Biser SA, Solomon R. Hyperthermic treatment of post-LASIK corneal striae. J Cataract Refract Surg. 2004 Mar. 30(3):620-5. [Medline]. Narvaez J, Chakrabarty A, Chang K. Treatment of epithelial ingrowth after LASIK enhancement with a combined technique of mechanical debridement, flap suturing, and fibrin glue application. Cornea. 2006 Oct. 25(9):1115-7. [Medline]. Toda I. LASIK and the ocular surface. Cornea. 2008 Sep. 27 Suppl 1:S70-6. [Medline]. Johnson JD, Harissi-Dagher M, Pineda R, Yoo S, Azar DT. Diffuse lamellar keratitis: incidence, associations, outcomes, and a new classification system. J Cataract Refract Surg. 2001 Oct. 27(10):1560-6. [Medline]. Donnenfeld ED, Kim T, Holland EJ, et al. ASCRS White Paper: Management of infectious keratitis following laser in situ keratomileusis. J Cataract Refract Surg. 2005 Oct. 31(10):2008-11. [Medline]. Randleman JB, Russell B, Ward MA, Thompson KP, Stulting RD. Risk factors and prognosis for corneal ectasia after LASIK. Ophthalmology. 2003 Feb. 110(2):267-75. [Medline]. Binder PS. Analysis of ectasia after laser in situ keratomileusis: risk factors. J Cataract Refract Surg. 2007 Sep. 33(9):1530-8. [Medline]. Caster AI, Friess DW, Potvin RJ. Absence of keratectasia after LASIK in eyes with preoperative central corneal thickness of 450 to 500 microns. J Refract Surg. 2007 Oct. 23(8):782-8. [Medline]. Randleman JB, Trattler WB, Stulting RD. Validation of the Ectasia Risk Score System for preoperative laser in situ keratomileusis screening. Am J Ophthalmol. 2008 May. 145(5):813-8. [Medline]. Knorz MC, Wiesinger B, Liermann A, Seiberth V, Liesenhoff H. Laser in situ keratomileusis for moderate and high myopia and myopic astigmatism. Ophthalmology. 1998 May. 105(5):932-40. [Medline]. Maldonado-Bas A, Onnis R. Results of laser in situ keratomileusis in different degrees of myopia. Ophthalmology. 1998 Apr. 105(4):606-11. [Medline]. Montes M, Chayet A, Gomez L, Magallanes R, Robledo N. Laser in situ keratomileusis for myopia of -1.50 to -6.00 diopters. J Refract Surg. 1999 Mar-Apr. 15(2):106-10. [Medline]. Probst L, Hakim O, Nichols B, Baird M. LASIK Results from TLC, The London Laser Center. The Art of LASIK. 2nd ed. 1999. 303-8. Reviglio VE, Luna JD, Rodriguez ML, Garcia FE, Juarez CP. Laser in situ keratomileus using the LaserSight 200 laser: results of 950 consecutive cases. J Cataract Refract Surg. 1999 Aug. 25(8):1062-8. [Medline]. Kezirian G, Casebeer J. The CRS LASIK Study. The Art of LASIK. 2nd ed. 1999. 293-302. Carr J, Thompson K, Stulting R, Waring G. LASIK: Emory Vision Correction Center. The Art of LASIK. 2nd ed. 2000. 281-92. Kezirian GM, Stonecipher KG. Comparison of the IntraLase femtosecond laser and mechanical keratomes for laser in situ keratomileusis. J Cataract Refract Surg. 2004 Apr. 30(4):804-11. [Medline]. Chen S, Feng Y, Stojanovic A, Jankov MR 2nd, Wang Q. IntraLase femtosecond laser vs mechanical microkeratomes in LASIK for myopia: a systematic review and meta-analysis. J Refract Surg. 2012 Jan. 28(1):15-24. [Medline]. Zhang ZH, Jin HY, Suo Y, Patel SV, Montés-Micó R, Manche EE, et al. Femtosecond laser versus mechanical microkeratome laser in situ keratomileusis for myopia: Metaanalysis of randomized controlled trials. J Cataract Refract Surg. 2011 Dec. 37(12):2151-9. [Medline]. Arbelaez MC, Knorz MC. Laser in situ keratomileusis for hyeropia and hyperopic astigmatism. J Refract Surg. 1999 Jul-Aug. 15(4):406-14. [Medline]. Argento CJ, Cosentino MJ. Laser in situ keratomileusis for hyperopia. J Cataract Refract Surg. 1998 Aug. 24(8):1050-8. [Medline]. Tran DB, Sarayba MA, Bor Z, et al. Randomized prospective clinical study comparing induced aberrations with IntraLase and Hansatome flap creation in fellow eyes: potential impact on wavefront-guided laser in situ keratomileusis. J Cataract Refract Surg. 2005 Jan. 31(1):97-105. [Medline]. Chiang PK, Hersh PS. Comparing predictability between eyes after bilateral laser in situ keratomileusis: a theoretical analysis of simultaneous versus sequential procedures. Ophthalmology. 1999 Sep. 106(9):1684-91. [Medline]. Gimbel HV, van Westenbrugge JA, Penno EE, Ferensowicz M, Feinerman GA, Chen R. Simultaneous bilateral laser in situ keratomileusis: safety and efficacy. Ophthalmology. 1999 Aug. 106(8):1461-7; discussion 1467-8. [Medline]. Dawson DG, Grossniklaus HE, McCarey BE, Edelhauser HF. Biomechanical and wound healing characteristics of corneas after excimer laser keratorefractive surgery: is there a difference between advanced surface ablation and sub-Bowman's keratomileusis?. J Refract Surg. 2008 Jan. 24(1):S90-6. [Medline]. Randleman JB, Dawson DG, Grossniklaus HE, McCarey BE, Edelhauser HF. Depth-dependent cohesive tensile strength in human donor corneas: implications for refractive surgery. J Refract Surg. 2008 Jan. 24(1):S85-9. [Medline]. Durrie DS, Slade SG, Marshall J. Wavefront-guided excimer laser ablation using photorefractive keratectomy and sub-Bowman's keratomileusis: a contralateral eye study. J Refract Surg. 2008 Jan. 24(1):S77-84. [Medline]. Wang Z, Chen J, Yang B. Posterior corneal surface topographic changes after laser in situ keratomileusis are related to residual corneal bed thickness. Ophthalmology. 1999 Feb. 106(2):406-9; discussion 409-10. [Medline]. He L, Liu A, Manche EE. Wavefront-guided versus wavefront-optimized laser in situ keratomileusis for patients with myopia: a prospective randomized contralateral eye study. Am J Ophthalmol. 2014 Jun. 157(6):1170-1178.e1. [Medline]. Moshirfar M, Betts BS, Churgin DS, Hsu M, Neuffer M, Sikder S, et al. A prospective, randomized, fellow eye comparison of WaveLight® Allegretto Wave ® Eye-Q versus VISX CustomVue™ STAR S4 IR™ in laser in situ keratomileusis (LASIK): analysis of visual outcomes and higher order aberrations. Clin Ophthalmol. 2011. 5:1339-47. [Medline]. [Full Text]. Kanellopoulos AJ. Topography-modified refraction (TMR): adjustment of treated cylinder amount and axis to the topography versus standard clinical refraction in myopic topography-guided LASIK. Clin Ophthalmol. 2016. 10:2213-2221. [Medline]. Jankov MR 2nd, Panagopoulou SI, Tsiklis NS, Hajitanasis GC, Aslanides lM, Pallikaris lG. Topography-guided treatment of irregular astigmatism with the wavelight excimer laser. J Refract Surg. 2006 Apr. 22 (4):335-44. [Medline]. Chang JS. Complications of sub-Bowman's keratomileusis with a femtosecond laser in 3009 eyes. J Refract Surg. 2008 Jan. 24(1):S97-101. [Medline]. Diffuse intralamellar keratitis (day 5). Pupil alignment or visual axis alignment for laser ablation. Spherical aberration post-LASIK. The original refractive error was -10.00 diopters. Coma in a patient with mild ectasia. This higher order optical aberration is also characteristic of decentered ablation zones and ectasia. Postoperative ectasia: Orbscan. Note the elevation on anterior and posterior floats and the thinning of the central cornea on the pachymetry map. Ectasia post-LASIK: Tracey WaveScan. Note the preponderance of higher order aberrations, including spherical aberration and coma. The Orbscan of this same patient appears in the image above. Normal astigmatism pattern with corneal topography. Normal corneal topography spherical pattern. Keratoconus suspect; inferior and asymmetric corneal astigmatism pattern. Keratoconus with elevation map; asymmetric and irregular astigmatism with inferior corneal elevation and steep area of inferior cornea.